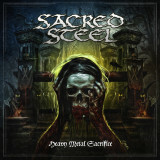 Having greatly enjoyed Sacred Steel's 2006 release, Hammer of Destruction, I looked forward to getting a listen for their latest, Heavy Metal Sacrifice. Sadly, it's a distinct drop in quality from their earlier output. The Germans have gotten rid of of their frontman's cheesy 80s-style screams, which I actually never had a problem with -- the band's a retro act, after all --, but failed to get him to rein in his other frustrating vocal qualities. Simultaneously, they succeeded in taking a lot of the excitement out of the songs they put on their newest album by slowing them down and reducing the melodies, making Heavy Metal Sacrifice a fairly uninteresting experience. Sound-wise, the music isn't bad. Sure, Gerrit P. Mutz's nasal clean vocals, often off-key enough to be distracting, have often dissuaded listeners who otherwise would be fans, but the band is tightly together and is able to summon...well, maybe not original riffs, but at least an often-clever copy of riffs from B-level heavy metal bands of the 80s such as Sword or Powerlord. The album, while well-produced, still has a raw edge to it that is hard to get in the modern day with digital equipment, and the title track's crisp speed metal is a welcome introduction. Nor are all the tracks duds; Let There Be Steel's thrashy verse is spot-on and faultless, and Children of the Sky has a NWOBHM vibe that drives the song, one of the few places on the album where a drawn-out chorus works. Where Heavy Metal Sacrifice falls apart in a big way, though, is in the by-the-numbers songwriting and the uninspired melodies, many of which are slow enough to try the patience of a doom metal fan. Listening to Mutz's idiosyncratic vocal style on fast-paced thrashers, where he doesn't hang on one note too long, is one thing, but listening to attempts at epic heavy metal like The Sign of the Skull or the off-key march of Vulture Priest makes for a painful experience. To make matters worse, almost all the songs, even the good ones, cut their tempo for a slow chorus, giving the listener a little taste of this failing in just about every song. The shots at an epic track continue on Beyond the Gates of Nineveh, where the band works over the same riff and vocal line for almost eight minutes. They don't sound like they're having fun, a state of mind mirrored by that of the listener. Mutz and his bizarre vocals don't help Heavy Metal Sacrifice, but he's not the main problem and anyone who likes the band is used to him anyway. Vocals aside, though, Heavy Metal Sacrifice remains a boring album with few good melodies or, for the most part, any real fire in the tracks. Which is too bad, because Sacred Steel can do much better than this -- and has done so in the past, warts and all. Die-hard fans may still be able to stick through this one, but those who do can be assured they will be making a real "heavy metal sacrifice".